Slip into your swimsuit and wander outside to the sparkling pool. Cool aquamarine waters are the perfect antidote to the seasonal heat, while waving palms and cherubic water features add the finishing touches to this urban oasis. 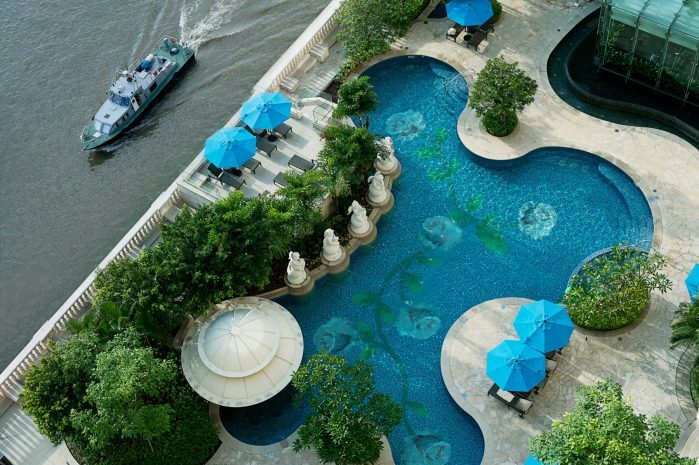 After your swim, watch the ferries crisscrossing the Pearl River from your vantage point on the balcony, or soak up the sunshine on the poolside loungers. Mistral Restaurant serves iced drinks and light refreshments from shaded tables on the nearby terrace. At night, the pool is illuminated to complement the bright lights of the city skyline, creating a stunning backdrop for al fresco parties and wedding receptions. The pool stays open until 10pm, so on balmy summer evenings, bring your day to a storybook close with a swim under the stars. Guests staying at one of the hotel’s opulent Mansions are entitled to the exclusive use of a second swimming pool, with an elaborate mosaic floor and unparalleled river views.